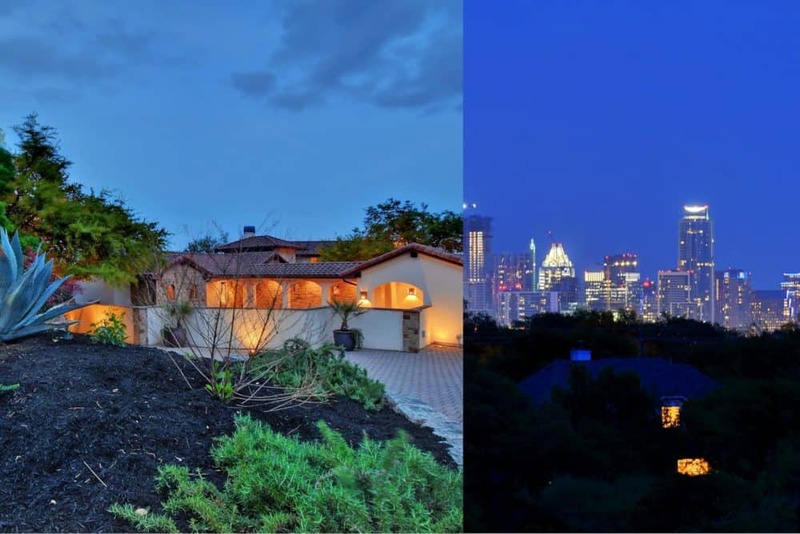 + Set on Top Private 5+/- Acre Lot with Breathtaking Downtown skyline views and the Hill Country. From curbside to poolside, this gorgeous custom home is set on a rare and private 5+ acre hilltop with breathtaking downtown Austin and Texas Hill Country views. The property borders the Barton Creek Greenbelt and Sculpture Falls is a few minutes walk. This is one the only homes with direct private access to the Barton Creek Greenbelt. This home is in a cul-de-sac located in the exclusive, gated, luxury community of Woods of Westlake Hilltop. This luxury community is part of the highly-rated Eanes ISD and is only 5 minutes to Westlake High and Forest Trail Elementary as well as being convenient to multiple private schools. Upon arrival, you’ll be met with a spacious, storybook, garden courtyard entry where you can enjoy your morning coffee or afternoon tea. The arched iron glass double doors welcome you into a beautiful foyer. Moving through the home, the 1st thing you notice is that the great room is bathed in natural light and like most of the home, has sweeping views. There are many luxuriously subdued accents such as high-end Pella Windows, hand-crafted wrought iron, custom chandelier by local Austin Craftsman, rounded corners, art niches, arches, stone-front fireplace, Hardwoods and Honed-filled Travertine Tile floors, huge windows and extra-high ceilings throughout. An expanse of windows and glass doors give you sweeping views of Downtown Austin and Hill Country. The glass panel wall opens the home up to the outdoor living area that has a constant light breeze off of the Greenbelt below. When your all rested up from enjoying the views, go out to the play house and take a ride on one of 2 zip-lines or hike on your own property to the Barton Creek and hunt for fossils along the way. There is also a private sport court. This home really is like being on vacation. On the lower-level, you will enjoy multiple living options such as a media/ playroom with surround sound with space perfect for game time or enjoying a movie with the family. There are also two bedrooms with walk-in closets on this level and a balcony that stretches the width of the lower that has access from onre of the bedrooms and media room. There is also a mud room, additional storage and access to your 3 car garage. The private master suite with high, trey ceiling, recessed lighting and rich travertine flooring and allows for both seclusion and tranquility overlooking the Barton Creek Greenbelt. The spacious master suite contains an over-sized soaking tub, and a large walk-in shower with his and her shower heads, 2 vanities and ample storage options. Any chef would adore the open, gourmet kitchen including the professional grade, Wolf 6 burner Range; JennAir Commercial hood/fan; Subzero Refrigerator, Bosch Dishwasher, granite counters, insta-hot water, stainless steel farm sink and much more. The Butler’s Pantry/ Utility Room is close to the kitchen is equipped with more cabinetry, large sink with disposal and a 2nd dishwasher, 2nd refrigerator. Both family and guests have plenty of room to work and play in this home. You and your guests will love that there are two guest rooms on the main level, one has en-suite bath with double vanity, the other is across the hall. You will also enjoy a 1/1 casita style guest bedroom with en-suite in the pool area and has access to outdoor kitchen. There also another room that can be used as an office or den on the main level. The swimming pool is special in that it is a chemical-free pool that is solar heated. The pool area looks like it belongs in a resort and is contained in a private courtyard for added privacy. There is also a separate hot tub for relaxing on cool evenings.